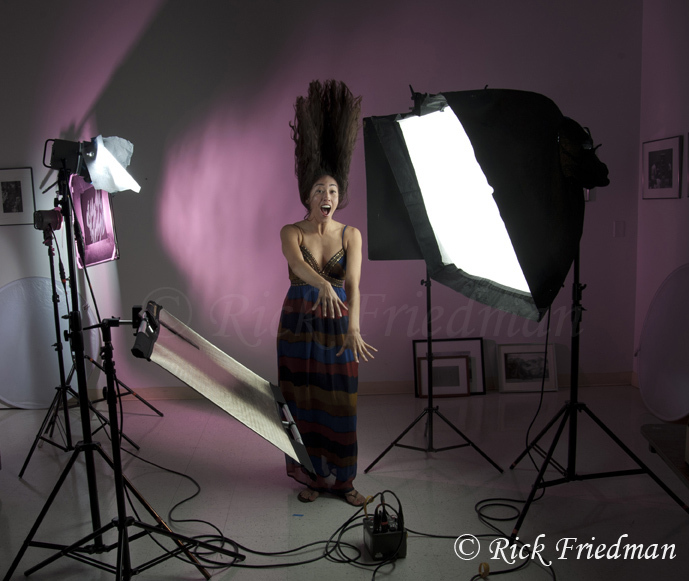 Actress, model & student Marisa Quintanilla on the set at my Location Lighting Workshop at Calumet in LA. The set, created by the students and myself using a Dynalite Roadmax MP800 pack, 3 Dynalite strobe heads, 1 with a Dynalite 30 degree grid spot and grid holder. Light modifies include a Chimera Softbox, Rosco gels, Cinefoil , Tough Spun, a California Sunbounce Micro Mini, Calumet light stands and a Chimera Sunsratch window pattern and frame, which throws the pattern on the wall. The next stop on the “Location Lighting Workshop Tour” is Calumet in San Francisco.